This pane allows you to build rigged HDAs. You can create simple single control rigs for layout assets such as houses/props or more complex character rigs with the use of a series of modules. The modules are added to the interface by clicking their icon, loading from file, loading from an existing HDA, or from a preset. Autorig System contains various modules for biped, quadruped, and facial rigging. Each the these modules contains a set of guide objects that you can position within your mesh to determine the location of the final rig elements. Additionally, each module has various options and settings to determine the features of the final rig. Click + to add a New Pane Type and select Autorigs. Click the New Autorig Asset button to open the Create New Autorig Asset popup. Give your asset a name and a type. Select your Rig Geometry Source. This can be None, Operator, File, or Standin. Selecting Standin will create a box. Choose the Autorig Type. This can be a Blank Rig, Biped, or Quadruped. Determine if the file path will be embedded in the .hip file or saved to disc. Choose how you'd like your geometry to be captured. By default, this is Biharmonic. Decide if you'd like to display the deform SOP. This if off by default, since it will be very slow if you have a heavy mesh for Biharmonic capturing. Choose a custom icon for your asset. These settings can be changed later. This will create an HDA in the chosen location with the chosen name. Currently the Operator Type will use the asset name. For example, if your asset name is char0001, the HDA Type will be defined by char0001.hda. Within this HDA there will be: master_node_guide, stand_in, and geo_skin nodes, which are internal placeholders (not interactive). A new tab will be created, containing the settings for the current asset. All assets will contain a master module. In its options, you can set a custom label which will appear within the circle. You can also change the size, color, and position of the master node. To review or edit the HDA settings, you can click the gear menu at the top of the asset tab. Use the Biped, Quadruped, or Import Preset options on the Presets tab, or build your own rig using the biped or quadruped modules. For this example, we will build a rig using the modules on the Biped Modules tab. Clicking on the Spine button will add this module to your asset in the viewport. You will see a series of guide objects which can be moved into place to define the shape of the spine. 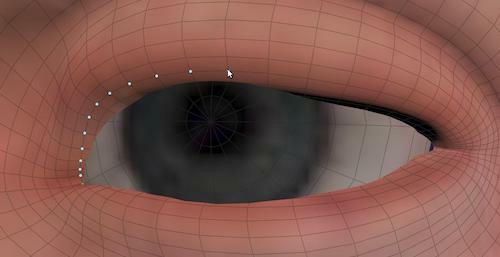 Turn on Interior Snapping in the viewport which will snap to the center of the geometry under the cursor. This is especially useful when setting up the fingers in the hand module. Each of the modules have tabs for Options, Parameters and Proxy Parameters. You will need to select a parent for each of the modules using the dropdown menu. For example, the parent for the spine should be the master_node_guide, the parent for the head should be the SPINE_TOP_HOOK, the parent for the legs should be the SPINE_BASE_HOOK, etc. The Arm, Leg, Hand, and Foot modules have options for mirroring. This will display a mirror copy of the current module’s guide objects. They are not selectable or editable as their positions are determined by the main guide objects. The Hand and Foot modules have options to choose between a Glove/Boot type and a Fingers/Toes type. The Fingers and Toes types allow you to choose the number of fingers or toes you rig will have and if you want a thumb or big toe. There is a hard limit of up to 99 fingers or toes. However, building an asset with this many fingers/toes is not recommended. Click File > Save and save the settings into the HDA, file on disk, or a different HDA. You can save individual modules to reuse on other characters by clicking → Export. Click Generate Rig to build the asset. The current settings will be saved with the HDA. If a custom name has been added to the master node, it will be saved as a geometry section into the HDA. The specified geometry will be added to a geometry node according to the settings. Each module will build the rig elements needed for that part. The asset will be saved and locked. The assets tab will be removed from the interface. The Face Modules tab lets you add a facial rig to your autorig. The BasicFace module lets you open and close the jaw and direct the eyes. The AdvancedFace module gives you much more control over eyes, jaw, lips, eyelids, and face deformation. The following documentation details the AdvancedFace module. These facial rigs are opinionated. 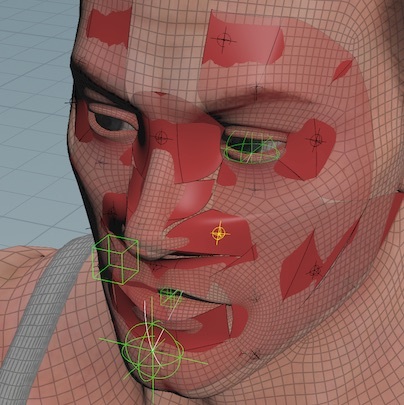 They demonstrate a particular approach to facial rigging, and how to implement a facial rig in Houdini. Even if you prefer a different facial rigging style, they probably contain ways of implementing facial rigging in Houdini that you may find interesting or instructive. In the Autorigs pane, click the Face modules tab. Click the Advanced Face button to add the advanced face module to your rig. The face appears in the scene at a relatively arbitary position. 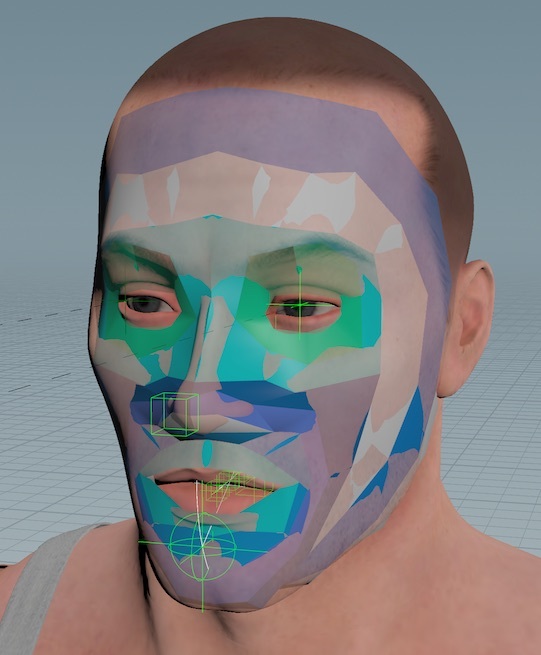 Select the main positioning jack at the tip of the nose, switch to the Translate tool, and move the face mask close to your character’s face. 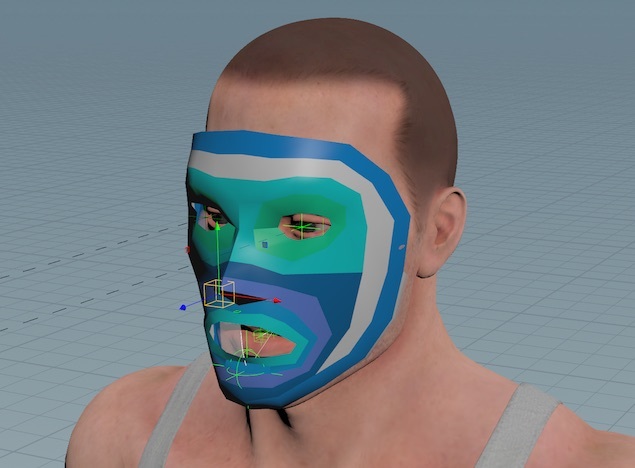 You should position the mask in front of the face, but it should not touch/intersect the face. The module will ray the mask onto the face, so there should be a small gap. You can scale the face guide using controls on the Guide parameters tab. In the Autorigs panel, you can start filling out the fields on the AdvancedFace options tab. If you already added a Head module to the rig, the face will parent itself to the head bone. Otherwise, you can select the parent bone using the Parent menu. If the head geometry is not in the same object as the overall character skin, turn on Use separate geometry, click the chooser button and select the object containing the head geometry. If the character skin geometry has a primitive group for the head, enter the group name in the Head group field. The Visibility controls let you turn different guides on or off. You can use these controls as you work on the rest of the options. When you have the face guide positioned near but not touching the face, click Generate cage guides. 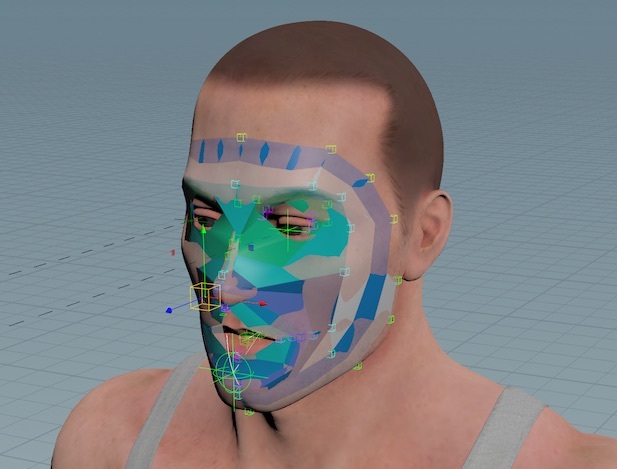 This generates a polygonal face cage, with markers at each point, and projects it onto the face geometry. Make sure to circle the eyes and the lips. 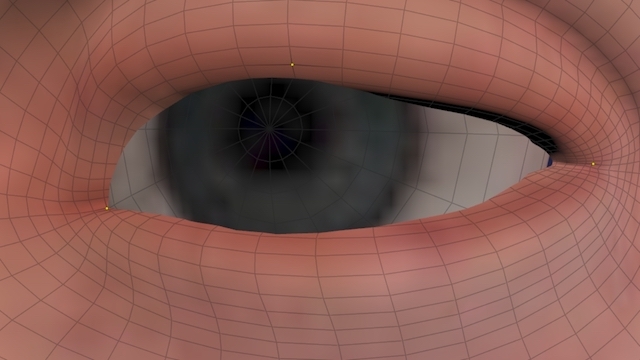 The tool projects from the marker onto the face along the geometry normal, so the closer you have the marker to the face, the more accurate the projection will be. You can scroll down and turn on Secondary guides to get finer detail markers between the primary markers. These normally follow the primary markers but you can show and position them manually. As you work, you can click Snap cage guides to face geo to snap the markers back down onto the face geometry. 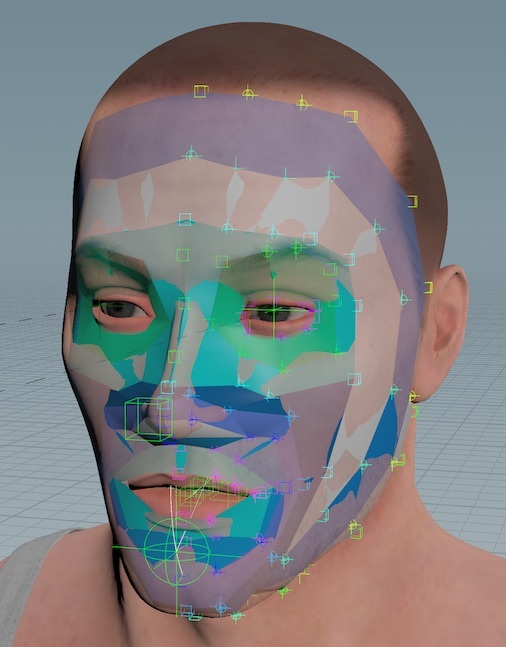 When you have the polygonal cage positioned properly on the face, click Generate character mask. This generates a NURBS control surface the autorig will use to deform the face. The tool may be unable to generate a mask from the polygonal cage from the previous step. Unfortunately the tool cannot currently give any guidence about what went wrong. If you get this message, go back to the previous and look for problems with the polygon cage: overlap, crossed markers, markers very close together, and so on. If the tool can generate the NURBS mask, it automatically switches to the Guide parameters tab. Next you will build locators on the mask. These locators deform the mask, which drives deformation of the face. On the Guide parameters tab, click the Locators sub-tab. Click Presets and choose the initial number of loctators to create, 19 or 51, depending on how much fine control you need over facial movement. The tool sets up the preset locators distributed around the face. You can move, add, or delete locators. To add a locator, go to the top of the Locators tab. See the Name to the locator name, turn on Mirror if you want to create a mirror locator on the other side of the face. Set the Parent type to None for no parent locator, or to a parent type. Click Add locators, then click a point on the face in the viewer to create a locator there. To delete a locator, find the locator in the list and click the delete button above it. To move a locator, find the locator in the list and click the Place button next to it. Then click a point on the face in the viewer to move the locator there. You can give important locators "parents" that are larger and offset from the face to make them easier to select and manipulate. To give a locator a parent, find the locator in the list and set its Parent type to "NURBS". To share a parent between multiple locators (so manipulating the parent drives all its children at once), go to the top of the Locators tab. Set Parent type to "Custom". Enter a meaningful name for the parent. Turn on Mirror if you want to create a mirrored parent on the other side of the face. Click Add parent, then click a point on the face in the viewer to create the parent above that point. Then for each locator you want to be a child of the parent you created, find the locator in the list, set its Parent type to "Custom", set the Parent field to the parent’s name, then click Update. In the Autorigs pane, click the AdvancedFace options tab. You can turn off PolyCage, Guides, and Mask to hide the mapping controls. If you don’t need to set up the jaw, eyes, or lips, turn off the corresponding checkboxes under Components. Set the axis aroound which the jaw can rotate. If you want to be able to move the jaw side-to-side (which is necessary for chewing motions and some expressions), turn on Enable translate. If you turned on Enable translate, you can sepcify which axes the jaw can move in using the Translate axis menu. If the eyes are mirrored across the character’s axis of symmetry, specify which eye the tool should use for selection, Left or Right. The eyes are not mirrored, turn off Mirror. You will have to make selections for each eye independently. The tool lets you pick a certain number of points along the eye lids, and turns these into control markers. Set Lid controls to the number of points you want to use as controls, 5 or 9. If you want to be able to make the top and bottom eyelids stick to each other, turn on Sticky. If you don’t need this control, turn Sticky off to simplify the character controls. Click Build left/right upper lid. In the viewer, select 3 points along the bottom of the upper lid: the first point (where the lid hinges), a middle point along the length of the lid, and the end point (where the lid hinges on the other side). The three points should be along the same edge loop. You can visualize the edge loop by holding ⇧ Shift + A as you move the mouse pointer over points (but remember to release ⇧ Shift + A before you select a point). When you have the 3 points selected, press Enter. Repeat for the lower lid. If you turned off Mirror, repeat for the other eye. If the character’s eyeballs are in a separate object, turn on Use separate geometry and choose the objects containing the Left eye geometry and the Right eye geometry. If the model has primitive groups for the eyes, enter the group names in the Left eye group and Right eye group fields. 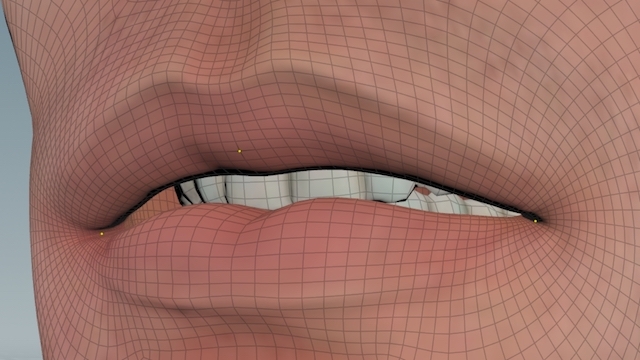 The tool lets you pick a certain number of points along the lips, and turns these into control markers. Set Lip controls to the number of points you want to use as controls, 5 or 9. If you want to be able to make the top and bottom lips stick to each other, turn on Sticky. If you don’t need this control, turn Sticky off to simplify the character controls. Click Build upper lip. In the viewer, select 3 points along the upper lip: the first point at the edge of the mouth (where the lip hinges), a middle point along the length of the lip, and the end point (where the lid hinges at the opposite side of the mouth). When you have the points selected, press Enter. After you've built the jaw, eyes, and lips, you can move on to other modules (arms, legs, and so on), or if the face is the final module, you can generate the rig. 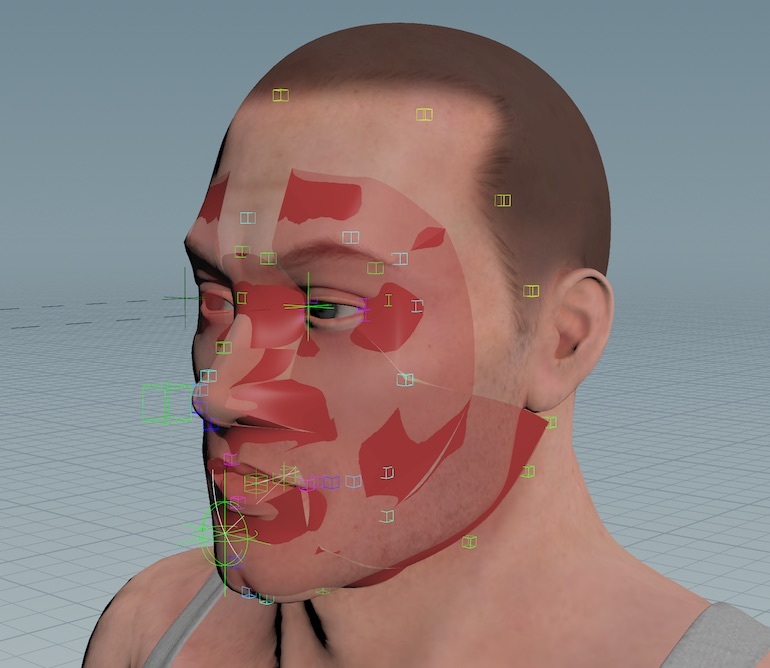 The generated facial rig is useful on its own, but it also works as a starting point. You can add to it or edit it to suit your needs. Keep in mind that after you've generated, the generated rig asset contains a JSON file containing all the autorig options. You can start a new autorig template from this JSON file (using File ▸ New from ▸ HDA in the autorigs pane) if you need to go back and change settings and regenerate a new rig.